Bio: Telling stories has been a part of Kindal Debenham’s life ever since he first put down a book, looked around and asked himself ‘But what happened next?’ That question led him to write his own stories to find the answer he was looking for, and from then on he was hooked. Writing became a passion that followed him through school and led him to the writing group where he met his incredible wife-to-be, Emily. Somehow, she continues to tolerate him, and they recently had their first baby girl, born in March 2011. Writing has brought him this far, and he hopes it will continue to accompany him for the rest of his life. He’s still trying to find the answer to what happens next, and he is grateful to all those who are supporting him in his journey. Thanks for your support, and he hopes you enjoy the story! Kindal: I think the first time I wanted to be a writer was back in high school. I had a project that I worked on for years that I always wanted to publish, but I never thought much about trying to make a living as a writer. It took me a long time to realize that writing was the way I wanted to make a living for myself and my family, but I figured it out eventually. Kindal: I majored in Molecular Biology at Brigham Young University. At that point in time I had more or less resigned myself to being a doctor or a researcher, so the biological sciences made sense. On the side I took just about every creative writing class I had access to, as well as joining a writing group at the Quark Science Fiction and Fantasy club. Of course, knowing what I do now, I would have gone back and taken a lot more of those writing classes, but that’s hindsight for you. Kindal: It’s a combination of things, really. Writing is one of the best ways to explore new ideas and concepts, and I love the feeling of creating a totally new world for my characters to run around in. The independence a writing career gives me is incredibly nice as well. Not having to accommodate other people’s concerns or schedules just to do my work is a really big bonus as well. Combine all of that with the sense of satisfaction that you get when you finish a good story and the enjoyment that other people can get out of it, and there’s no better career path than this one for me. Kindal: Well, it was a bit different than it would be for a traditionally published author. I basically had to find my own cover artist and copy editor, as well as get my own writing group started so that I could get content revisions done. Fortunately, thanks to my dear loving wife (she’s going to read this right?) I was able to track down the right people for each of those things and create a finished product. Kindal: Part of writing is getting discouraged every now and then. The fact is, most people are going to look at you like you’re a bit crazy, and to be honest most of us are. Rejection can get pretty rough sometimes as people disagree with the way you are writing something, or want to ‘help’ you choose an alternate, more profitable career path. That’s just how it goes. In dealing with that sort of thing, I’ve found it useful to keep in mind that there is discouragement and obstacles in every career path. For every starving writers and artists out there, there are just as many doctors and lawyers scraping the bottom of the barrel or dropping out to pursue other careers. You have to remind yourself that not everyone is going to like what you write, and that not everyone is going to appreciate what you’re trying to do and how. The important thing is to remain committed to your course and find your own way through the obstacles you face. Don’t let a few failures ruin your vision. Kindal: I think that depends on your point of view. My wife thinks I’m mildly crazy, but I’m betting people like Brandons Sanderson wouldn’t be very impressed. I typically write about twelve thousand new words a week when I am working on just one book. Most of the time I tend to be rewriting one book while I write the first draft of another one. That means I usually write about six to eight thousand new words on one book while I rewrite about ten to twelve thousand words on another one. I’d write more, but the full time job kind of takes up too much of my time for that to work. Deirdra: Can you tell us a little about your book Wolfhound? 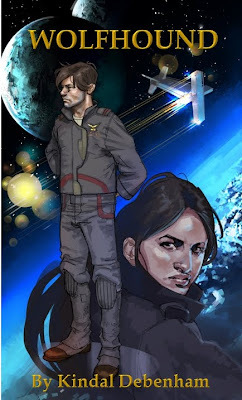 Kindal: Wolfhound is an action adventure story written from the perspective of Ensign Jacob Hull, an officer in the Celostian Navy on his first cruise. Pretty much everything goes wrong for Jacob. He’s assigned to a hard luck crew testing an experimental vessel, members of the crew don’t take too kindly to him, and to top it all off, a disaster puts every person on board in mortal danger. It’s a story about heroism and adventure, and about remaining true to your responsibilities even when it is hard. Kindal: Well, I wrote Wolfhound at a time when I was feeling a bit discouraged at the course my life was taking. In essence, it is a story about how someone can face all the obstacles and disasters that this life can throw at us, and how that person can choose to rise above those challenges instead of being crushed by them. In a way, that’s what I came away with from writing Wolfhound, and I would hope that my readers are able to have that as well. Along with an intense appreciation for railguns and explosions, of course. Kindal: I come up with a lot of story ideas a bit out of the blue. I typically have a bunch of facts, possible plots and story ideas all running through my head, and occasionally some of them just happen to mix together and form an idea compelling enough that I have to write it down. From there, I tend to sketch out a rough outline of where I am going to go with the story, but I never consider myself bound to it. If the story starts to bend a bit out of line from where I was originally going to go with it, I let it happen. Writing is always at least half structured planning and half lucky discovery for me. Kindal: I hit writer’s block for one of three reasons. Either I’ve burned out, I don’t know where I’m going next, or the previous section is bad enough that I need to rewrite it before I move on. Burning out is a result of my own reckless behavior; I’m still new enough at this career path that I look at a project and say “Hey, I can work a full time job and still revise half a book this week.” It…doesn’t always work out that well. Rest can really help with that problem. If I don’t know where I am going next, it is a very good time to sit down and sketch out a better outline of where the story will go, which will get me excited enough to start in again. As for writing the occasional bad section, that happens every so often when I am working on a first draft. It’s like replacing a bad foundation so that the rest of your building can stand strong. Kindal: My wife. Without her none of my efforts would have ever amounted to much. She’s the one who has always encouraged me in this career path, and she has never questioned my ability to do what needed to be done. Of course, she also seems to have ended up with the marketing brains as well, so that helps me be able to focus on the writing while she helps me that way. Kindal: Well, good dialogue is one way that characters can kind of show their personalities. My friends and I tend to banter comments back and forth, and I borrow a lot of that for the dialogue in my books. I also tend to give each of my most important characters a kind of theme song. In fact, some characters and even some of my books are pretty much inspired by a particular song that fits them in my mind. Kind of weird, probably, but it works for me. Kindal: Well, there’s a lot of them out there. Michael Stackpole was always one of my favorite authors, even since I was a kid. I think his I, Jedi, and Rogue Squadron books will always be among my cherished possessions. Brandon Sanderson is another author I’ve come to enjoy. My wife introduced me to the Mistborn series, and from there I’ve kind of been hooked on his work. There are a lot of other authors out there, from Dan Wells to Patrick Rothfuss, Timothy Zahn to John Scalzi, David Weber to Jack Campbell. Too many to mention everybody, but there’ve been a lot of authors that I have loved to read. Kindal: I like to read, obviously. Unfortunately I have a weakness for videogames (the nerd is strong in this one), but I’ve managed to avoid getting sucked into any MMORPGs. Otherwise I’d never get anything done. Running has always been a hobby of mine as well. Kindal: Don’t give up, and don’t overlook the opportunities you are given. There are plenty of people willing to help you learn what you need to know, and the nature of publishing today is open enough that anyone who is willing to work hard enough at it will have at least some success. Just don’t let the occasional failure or discouraging friend turn you away from what you really love. Kindal: Currently, I am working on revising the sequel to Wolfhound, a book called Badger. At the same time I am writing the first draft of a sequel in another series. It’s about a steampunk detective named Hector Kingsley. As the first book is titled The True Adventures of Hector Kingsley, the second is appropriately The Continued Adventures of Hector Kingsley: Mysteries in Whitechapel. Or at least those are their working titles for now. And waiting in the wings is another series, with the first book called Iron Angels. It’s another science fiction adventure novel, though it’s in a completely different universe. Kindal: Wolfhound will be going up on Smashwords and Amazon. People can also order my books through Wandering Leaf Publishing’s website. Kindal: Just thanks for the interview! I really appreciate the chance to talk about my work. Anyone else interested in what I’m up to can visit my blog at www.platmeusa.blogspot.com. Hope all goes well for you! Thank you so much, Kindal. It’s a real honor to get your insights. Great interview! And lots of good luck to Kindal. Awesome interview!!! Loved the questions, and the Kindal's answers - planning to add that book to my Christmas wish list.